Home Features Coarse Fishing …and for my next trick – The Disappearing Pike! If I could reproduce on stage the miracle I performed – with a witness – in the winter of 2015-16 on the banks of The Wye just above Hay, I’d now be in great demand and contemplating a comfortable retirement. I might even invite David Copperfield onto my show. The water had been high that day, high and fast, so my piking tactics had been somewhat crude – but effective! I’d simply swung-out a whole herring beneath a bare, overhanging willow, engaged the bait-runner and sat back with The Telegraph. I’d been just a little keener than usual because I hadn’t managed to get decent shots of my previous two pike captures; if I caught another, I’d kneel with the fish in that hollow – there – with a nice backdrop of raging river and hills. I’d already set-up the tripod and camera so all I had to do was get me another biggie. In such conditions, the rod-top was constantly pulling over and springing back but around 11 o’clock it banged sharply and the bait-runner could be heard quietly purring. The strike was made immediately and satisfyingly for the weight at the end of my line was quite substantial; indeed, I did initially wonder if I was snagged, but that first heavy thump told me I was straight through to a big beast. The fight was brief but lively, the pike surging downstream with the current and ripping line from the spool no fewer than three times, as I recall; then she was in the net. After a life-time’s piking I’m still amazed at how pike seem to double in size once they’re on the bank or, to put it another way, how small they look in the water. Mindful of this, I’d estimated the beaten fish at around 14-15lb, but on taking the net into both hands and placing its occupant on the unhooking mat, I’d been amazed to find a clear mid-twenty looking up at me. Whoopee!! I’d get some superb shots of this fish – especially if well-known local angler, Jeff Morgan, was nearby or at home. I had his mobile number. The fish was easily unhooked, weighed in a plastic carrier-bag and promptly zipped into my pike-tube. At 24lb 8oz, I made absolutely certain that the tube was firmly staked-out in the soft mud, the two bank-sticks pushed way down with less than 12” proud of the water. I washed my hands in the river and marked the occasion by firing-up the Storm kettle for a cuppa. While the volcano did its job I gave Jeff a ring and was delighted to find he was at home, a mere 10 minutes from where I sat. Well, Jeff Morgan witnessed everything. Nothing but a fishless, empty tube hung dripping between my clenched fists! I looked at the net in horror and disbelief, then at a bewildered Jeff, camera still at the ready and literally dumbstruck. How? What? Why? We shared the same thoughts and stood there mystified, united in our confusion and hardly daring to believe the plain truth – the net was, indeed, EMPTY! “But…but you saw the fish, Jeff!” He nodded vigorously. “You saw me take the weight, Jeff!” He agreed he had, and he was quick to add that he’d seen nothing rocket from the tube…not even a splash or a bow-wave in the shallow margin – nothing! “You must have a rip in your net”, he ventured, “that, or the zip’s come away from the mesh” I expressed my doubts and gave it a quick inspection but I found no fault. Desperate to solve the mystery, I pulled myself from the mud and clambered up the bank to hang my once-trusty pike-tube from a dead branch. Together we went over the net with the finest of toothcombs but there was, we agreed, no way out other than through the puckered release hole, but how could twenty-four and a half pounds of fat Esox have forced its way through without so much as a ripple – and so instantaneously? I tell you, David Blane would love to know that fish’s secret but not as much as I would! 24lb 12oz caught and retained in the same pike tube later in the season. To comment on this mystery, go to…. 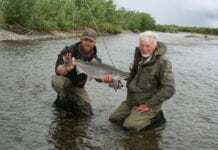 Previous article‘Of Sharks and Little Fish’ by Stuart Tod of Cadno Silk Fly Fishing Lines.